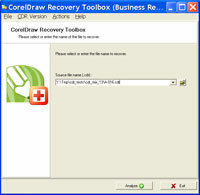 An efficient and affordable recovery tool for the most complex data corruption cases involving CorelDraw *.cdr files - CorelDraw Recovery Toolbox. The program features a simple and intuitive user interface that immensely simplifies the recovery of *.cdr files, especially in comparison with complicated and confusing console tools. TimeGen is an engineering CAD tool for electronic design engineers. Specifically, TimeGen is a digital waveform tool to create and modify timing diagrams to embed into design specificaitons.